Have you tried this thing called penuche frosting? How is it different from caramel frosting or brown sugar frosting? My quick skim of super-reliable sources (you know, things like Wikipedia and Webster's dictionary) leads me to believe that penuche is a fudge-like candy made of brown sugar, butter, and milk. Candy. So unless you have a thick layer of fudge atop your cake*, cupcake, cookie, or brownie, I think a more fitting name for a topper made from those ingredients would be caramel, brown sugar, or penuche-like frosting--as far as I can tell, they're basically all the same. How have I gone 26 years without making caramel frosting? It's delicious, divine, decadent, and delectable. I think I've ignored this masterpiece of a cake-blanket because I've always had a bit of an infatuation with cream cheese frosting and usually opt for it over all others. Well, no more. Now it's a battle between the two as to which one most frequently applies itself directly to my derrière. 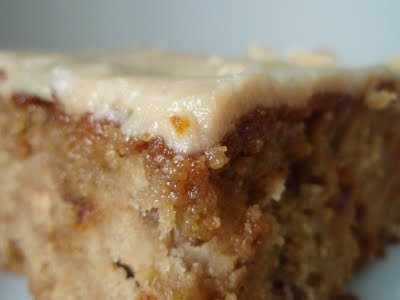 If you're familiar with caramel frosting or any recipe involving boiled sugar, you know how fickle the process can be. This recipe is no exception--if you don't work quickly after whisking in the powdered sugar, good luck spreading the frosting over your cake. You'll have to just eat it from the pot**. I can definitely see how it would be troublesome taking the time to frost a layer cake. Fortunately, all I had to do was dump and spread, and it worked out just fine. **Once again, not a bad proposition. Better than fine, actually--it seems I have a new obsession. Preheat oven to 350F. Grease a 13x9-inch baking dish. In a large bowl, cream the butter and the sugars and beat the mixture until it is light and fluffy. Beat in the applesauce and the egg. In a separate bowl, sift together the flour, baking soda, cinnamon, and cloves. Add to the butter mixture and stir until combined. Add the vanilla, oats, and cinnamon chips. Stir the batter until it is combined well and pour into the prepared dish. Bake 40-50 minutes, or until a tester comes out clean. To make the frosting, heat butter and brown sugar over medium until the mixture comes to a boil about 2 minutes. Add the milk, stir, and bring the mixture back to a boil, then remove the pan from the heat. Let the mixture cool a bit and whisk in the powdered sugar until thickened and smooth, lightened in color, and beginning to lose its sheen. Pour the frosting onto the cake quickly before it hardens and let it cool and set before cutting. That frosting looks insanely good! Oh, how I would love a slice of this cake with my coffee right now! oh how I love when you get new obsessions! Yep, I always that penuche was a candy too, but I've never had it. I've also never made caramel frosting, but apparently I'm missing out. Gotta put that on my list of things to do. Whether the name is quite right or not, the frosting does sound delicious! 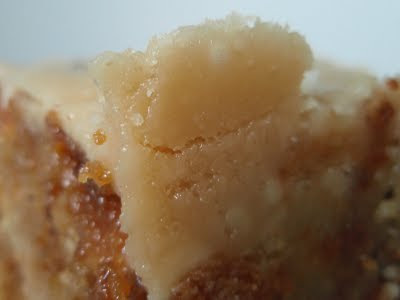 I have a recipe for penuche candy that I've been meaning to try for a few years. Maybe I'll just make this frosting instead! Caramel frosting does sound soooo decadent! Grace, this cake sounds sublime! 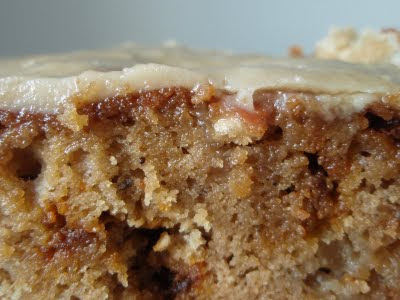 There is nothing better than a gooey sugar icing atop spice cake. Thanks for posting this easy to follow frosting recipe. Gooey frosting that tastes like caramel? Sign me up. Guess what? My Mother used to make penuche frosting all the time! Yup, sometimes she'd just pour some on wax paper into small puddles to have as candy...sometimes it would make it to the top of a cake. Either way it's soooo yummy! So, I'm drooling over your cake right now, Grace, not only because of the frosting, but the whole applesauce cake sounds fabulous! Love penuche! As a frosting it is indeed incredible. I have to admit that the kids have to fight me to clean the bowl on this one. We used to buy penuche fudge in Mackinac Island when we visited there. And my dad loved it, so mother always made a spice cake for him and used penuche frosting. Anything caramelly is for me and this is! I have a feeling this frosting would rate up there with coconut pecan frosting. Drool worthy. Um, can I eat a bowl of that right now? I too am obsessed with cream cheese frosting but can really get on board with most frostings. And recently I've been thinking about caramel frosting for a jam cake I intend to make. never heard it called penuche--you learn something every day! OMG, that is a great combo! What a wonderful cake! Wow I have not heard of that before, but it sure sounds and looks delish! Thanks for sharing! Thanks for explaining penuche. Heard of it but never tried, although the prospect of caramel frosting has me salivating. Looks fantastic. Your blog is making me drool all over the place. Seriously... and the close up shots and the gorgeous foods and the descriptions... wow!! I have found a new favorite place!! Your side notes always crack me up, Grace. I enjoy reading them as much as I do drooling over this spice cake! Oh my gosh. I love all things caramel. I must try this! Whatever it is you make it look good and my mouth is watering!!! I made a cake with a penuche frosting recently. My consumers were decidedly unimpressed. It was more like butterscotch than caramel, sad to say. Oh gosh! Caramel is my favorite flavor! I love this! applesauce! caramel! hehe love them both. just made salted caramel macarons. the first time i made caramel was a total disaster. it was bitter :S hahaha! I'm surprised I've never heard of penuche, but I'm very familiar with caramel. Yum! Of course, your cake would not be without cinnamon either way. Oh man this sounds great! Spread this over a spice cake and I would be sooooo happy. Oh that caramel on top looks so delicious. My mouth is soooooooooooooooo watering. After seeing this deliciousness I want to add it to my repertoire also. It sounds incredibly delicious and addicting. Fatal lovely combination! Penuche, caramel, brown sugar, browned butter- I'd eat any of them and moan with delight. Yum! I made caramel frosting for the first time just last month and had to scrape the stuck bits out of the pan because I was too slow. Mmmm, that bit on the edge with the extra frosting looks soooo good! Once, for daring bakers, I had to make caramel everything. And after 3 tries I finally got it right. And yes, anything involving melting sugar at high heats is very fickle indeed. How about this frosting mixed with cream cheese. The marriage of two good things! Or would that be gross? I would die and be in heaven with this! Grace, whatever you want to call it this is so fabulous + delicious and just what I enjoy to eat, bravo! I've never heard of penuche, but it looks/sounds amazing! This cake sounds amazing, such wonderful flavors. Looks great Grace! My mom always made that type of frosting for some cake I can't remember. Oh my, oh my, did I ever love that stuff! Yours looks perfectly delish as well. (Thanks for reminding me.... "oh, mom!..." Now this sounds GOOD!!!! Ive not heard of penuche before! I used to buy penuche in San Francisco when we visited Dan's family. I was glad I didn't live there all the time or I'd be as big as a house--I love the stuff. This frosting sounds wonderful! mm this looks so good,I have done a frosting like this but i think its just called brown sugar so I will try this. The combination of caramel and apples is an absolutely perfect one - this looks divine! Every flavour is beautifully combined in here & I oh so love your frosting! It screams: delciousness!! Oh Grace, that cake looks aaaamazing. I love those flavors. I especially love caramel. Great work my friend. I am going to make peaut butter cakw with this on top. that is my plan. nom nom nom. Penuche is one of my top favorite fudge's. The boy's too. Delicious. I LOVE anything caramel! What an amazing frosting, I can't wait to try it! ok...so I'm...ummm....much older than you (we won't go into specifics here) and I have never heard of panache frosting. where the heck have I been?!!! this looks wonderful! Yummy! This looks so good. Thanks so much for stopping by my blog. I appreciate it! Ah, gorgeous! This looks like the best frosting ever. I've never made Penuche before and I wouldn't have known how to describe it but somehow I knew what it was - blonde like butterscotch, maybe a little less smoky than caramel, the color of peanut butter fudge, and almost the same consistency. This frosting seems to make good use of the color and flavor. Very appealing! Whatever name you call that frosting it has been a fave of mine but then me and anything caramel-y go way back! Holy moly - an apple cake with caramel frosting. now THAT sounds like a happy new year to me!! I love penuche and have a very similar recipe, with just a tad more powdered sugar and a pinch of sea-salt...you know, salted caramel?! Slurp! This was just the recipe I needed for my husband's birthday cake. It turned out just as he remembered that his mom made. It was a hit....and easy to make.